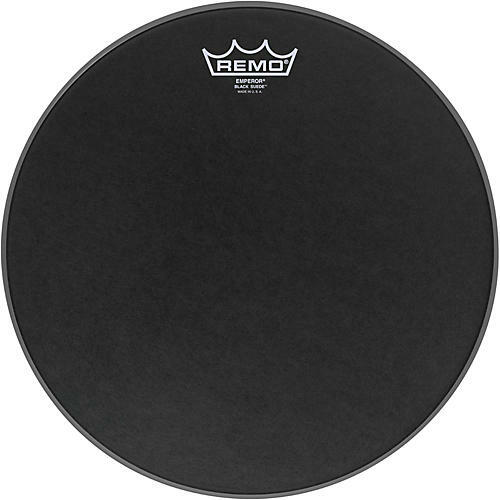 Remo Black Suede Emperor Batter Drumhead 13 in. Two layers of textured ebony for semi-bright sound in durable heads. The Black Suede Emperor drumheads feature two plies of textured ebony 7.5-mil film with a unique non-reflective look. Provides a soft feel, focused warmth, and enhanced mid-range tones for snare drums and toms. Their two-ply durability makes them ideal for hard-hitting applications such as pop, rock, R & B, punk, and funk. They are also ideal for resonant heads because of their esthetic look.